A-EM was approached by Goldsmiths to re-clad a deteriorating 1960s building. 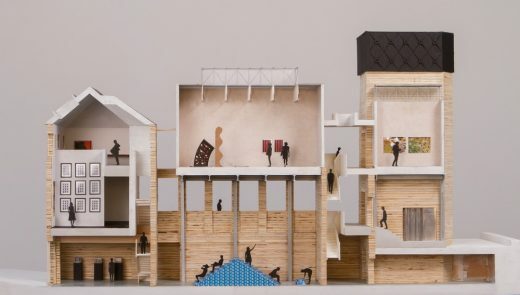 Early in discussions it became clear that A-EM’s imaginative design and use of materials could be applied to two further buildings for the same budget. The brief was reworked to also include an administrative link block and a brick-clad lecture theatre. The aim was to externally refurbish all three buildings, retaining primary structural elements, but to bring them together as an integrated whole. The buildings have been tied together visually by a horizontal line at the level set by the top of the lecture theatre. Below this line a ‘plinth’ is formed, finished in high performance dark cladding. Above the line a white render is used, so the taller building appears to perch lightly on the base below. New full-height glazing creates internal circulation and breakout spaces. New aluminium windows cut into the facades form continuous horizontal slots. They are tilt and turn windows, encouraging natural ventilation. Thermal performance is enhanced by new roof insulation, applied across all the buildings. The existing building stock has been reinvigorated economically and sustainably – and with great panache.